You could say the first half of 2013 has been a busy one for roofing manufacturers. All of the major residential roofing manufacturers have already rolled out several new roofing products and they’re not done yet for the year. The common thread running through the new residential roofing products is a focus on meeting the wants of consumers. TAMKO’s Heritage IR impact resistant shingle meets both those requirements. An expansion of the company’s Heritage series of laminated asphalt shingles, the Heritage IR features reinforced construction that meets UL 2218 Class 4 impact resistance standards. The Heritage IR shingles are made of fiberglass mat and non-woven polyester fabric reinforcement with a fine pattern of thermally bonded polyester fibers throughout the fabric providing additional strength. Designed to look like wood shakes, the laminated asphalt shingles are available in six color choices. GAF rolled out its Grand Sequoia IR Shingles in its Grand Sequoia Lifetime Designer specialty shingles category. Made of asphalt and fiberglass, the Class 4 impact-resistant shingles are designed with oversized tabs to give them a rugged wood shake look. In the first half of 2013, CertainTeed released two solar roofing systems to respond to homeowners’ desires for more energy efficient roofing products that can be added to their existing roofs. The Apollo II™ is the next generation solar roofing system to CertainTeed’s Apollo tile solar roofing system. Like its predecessor, Apollo II integrates into existing roofing shingles or with the installation of a new roof. However, Apollo II features enhanced deck integrity with new water channels and raised fastener locations, as well as easier wiring installation with its open space under the modules. The rack-mounted system has 54-watt monocrystalline photovoltaic (PV) panels. Weighing only 12 pounds, each module features 14 high-efficiency monocrystalline silicon solar cells for a power rating of 54 watts per module. Apollo II is lightweight, yet resistant to wind uplift and is designed to give a clean, seamless appearance. The Solstice® Solar Roofing System, available in AC and DC versions, features monocrystalline photovoltaic (PV) panels. Each 47-pound module contains 60 solar cells that produce a maximum electric power rating of 250 watts per module. The attractive and durable rack-mounted, high-performance modules can be easily installed on low-slope or steep-slope roofs. At Atlas Roofing, product innovation is the theme for 2013 with the unveiling of Pinnacle Pristine, StormMaster Shake and StormMaster Slate featuring Scotchgard™ and High Performance (HP) Technology. According to company spokesperson Christopher Burk, CSI, of the Think Agency, HP Technology is Atlas Roofing’s new asphalt shingles design for its dimensional architectural shingle. “It’s an oversized shingle, so there are fewer shingles required per square and it carries a 130 mph high wind warranty,” he explains. The design saves the contractor time, labor, materials and money without sacrificing quality. The installation savings translate into savings for homeowners as well. Atlas Roofing considers HP Technology the future of residential shingles, which is why the manufacturer released an entire line of architectural shingles. Adding to its line of artisan-crafted shapes and architectural dimension, GAF has introduced a diamond-shaped design as part of its Sienna™ Lifetime Designer Shingles line. The shingle design provides an Old World elegance with its clean lines and rich appearance. The exclusive design offers a unique alternative to standard architectural shingles. New roofing trends also emerged in the first half of 2013, with several roofing manufacturers unveiling new shingle roof colors. TAMKO added River Rock Brown to its MetalWorks steel shingles. It joins the Sierra Slate Grey and Vermont Blue colors in the StoneCrest® Slate line. 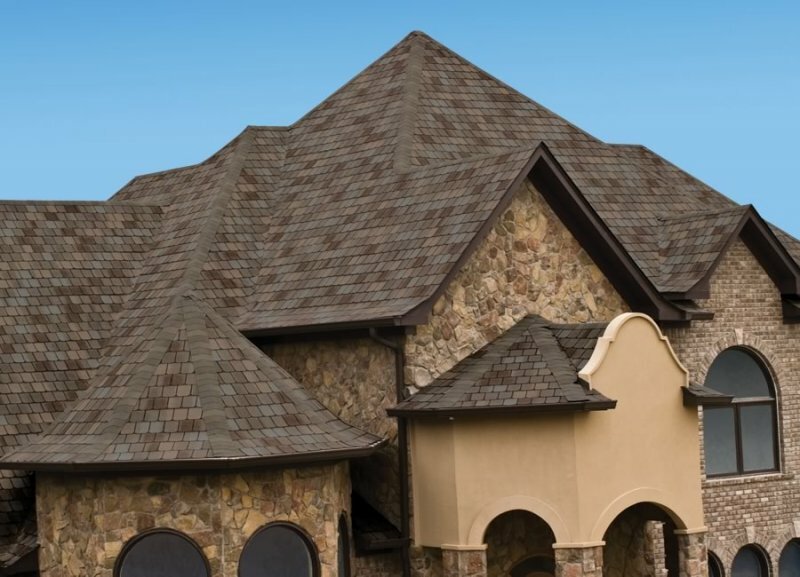 The company says River Rock Brown offers a classic, yet bold look to any roof. GAF ushers in a new TruSlate color line comprised of the Americana Collection and the International Collection. The genuine slate color line features five Vermont-sourced quarried roofing slates in meadow green, antique purple, autumn dusk, charcoal and rustic red. The three international collection slate colors are onyx black, greystone and mystic grey. The colors can be mixed and matched to create a design or a unique roof color scheme. Why not have our expert Storm Damage Inspectors come out and take a look? Click here to contact us today!